RADAR UPDATE: Weather radar this Sunday evening across the local area shows mainly quiet weather. 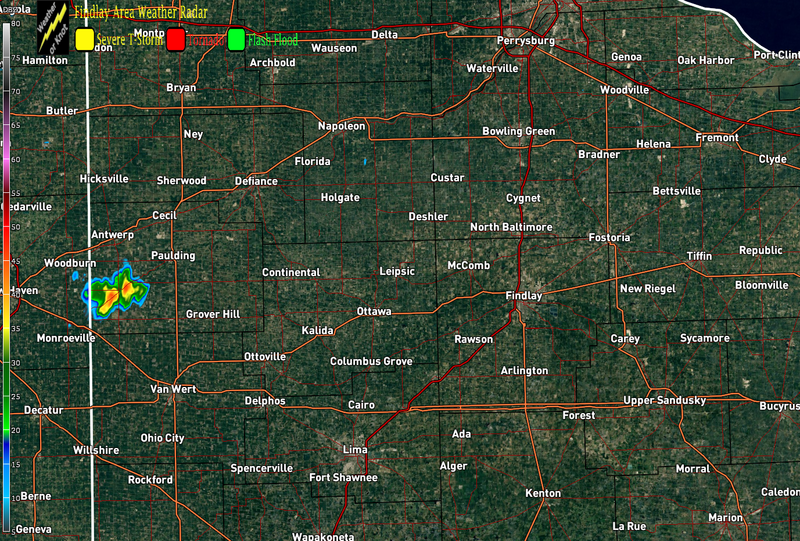 There are a few passing showers in western Paulding County currently. Those will fade away in the next hour or so as we lose the heating of the day. SATELLITE CHECK: Mainly clear skies are featured tonight across the Findlay area and Hancock County. It is seasonably warm as well. Temperatures currently are in the lower 80s. For the remainder of tonight, mainly clear skies can be expected. Low temperatures are forecast to drop back into the middle and upper 60s. WEATHER TO START THE WORK WEEK: Warm and humid weather will highlight the beginning of the work week. Periods of sunshine can be expected as well. There will be chances for showers and thunderstorms Monday through Tuesday Night. High temperatures Monday and Tuesday are forecast to top out in the lower to middle 80s. Low temperatures Monday and Tuesday Night are forecast to drop back into the middle and upper 60s. SEVERE WEATHER POTENTIAL WEDNESDAY: Wednesday will one more time offer warm and humid conditions. Also, a strong cold front will be moving into the area. With favorable wind conditions and plenty enough of surface based convective available potential energy (SBCAPE), the potential exists for strong to severe thunderstorms. That threat will continue into Wednesday Night, and early Thursday. As of this moment, the dominant severe weather mode looks to be from damaging straight line winds. The forecast will continue to be fine-tuned during the next couple of days to analyze the threat. THE REST OF THE WEEK, WEATHER WISE: The strong cold front will be moving through the Findlay area early in the day on Thursday. Cooler air will be on the way in, along with the wind direction being from the north and northwest. While there will be a slight drop-off in the temperatures, the weather will be more comfortable through the end of the work week. As the weekend approaches, warmer temperatures will be making their return. That will be due in part to the wind being from the south and southwest. Another cold front is forecast to move through the area by Sunday afternooon. That looks to bring back shower and thunderstorm chances. Posted on August 16, 2015, in Uncategorized and tagged Findlay, Forecast, Ohio, Severe, Sunday, Update, Weather. Bookmark the permalink. Leave a comment.